As we are a non-profit organisation, each year we rack our brains for fundraising ideas. In 2003 we undertook the enormous task of recording our own CD. After many, many hours of rehearsal, we spent one weekend in August recording 12 tracks. All members thoroughly enjoyed the experience and now we have a wonderful record of our magnificent sound! 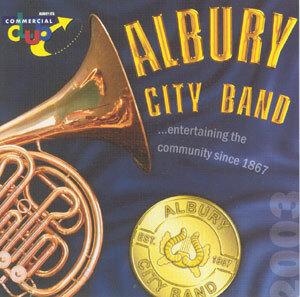 To order your very own copy, come along to one of our upcoming performances, or send a cheque/money order for $20.00 ($15.00 CD, plus $5.00 postage) to:- Albury City Band, P.O. Box 560, Albury, 2640.